The research projects in the Nomura Research Group range from studies on microbial physiology and gene regulation to the generation of natural materials from biorenwable resources. Defining transcriptional regulation and metabolism in bacteria. 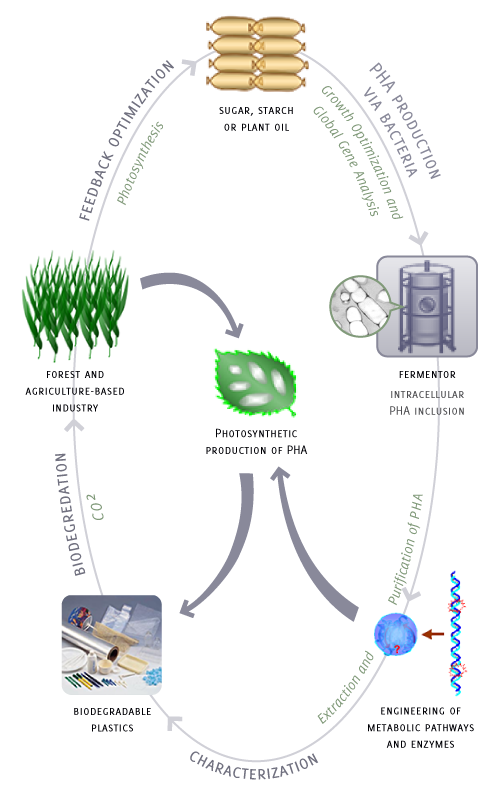 Enzyme and metabolic engineering for improved biodegradable polymer production. Polyhydroxyalkanoates (PHAs) are microbially produced, biobased, and biodegradable polymers that have a wide array of uses ranging from substitutes for non-biodegradable, petroleum-based plastics in bulk commodity products to biomedical applications. One of the limiting factors in PHAs being widely used for more specialized applications is the lack of control over repeating unit compositions and by extension the inability to produce polymers with desired physical properties. The long-term goal of this research project is to genetically engineer E. coli for the production of expanded classes of PHA materials with desirable material properties. The material properties of PHA polymers are dictated by the composition of their repeating units. PHAs comprised of repeating units of 3-5 carbon atoms are known as short-chain-length PHAs (SCL-PHAs) and tend to be thermoplastic in nature but lack toughness, while PHAs comprised of repeating units of 6-14 carbon atoms are known as medium-chain-length PHAs (MCL-PHAs) and tend to be elastomeric in nature. SCL-MCL PHA copolymers have material properties dependent on their mol ratio of SCL to MCL repeating units. It has been demonstrated in previous studies that SCL-MCL PHA copolymers that are 80-95% SCL and 5-20% MCL repeating units have material properties that are very similar to common petroleum-based plastics. To date, we have: (i) engineered a strain of E. coli to produce the highest levels of MCL PHAs from glucose to date and (ii) engineered the first strain of E. coli to produce both SCL and MCL PHA polymers from fatty acids with defined and controllable repeating unit compositions. We are working to further develop these strains so that they can produce SCL-MCL PHA and polylactic acid (PLA)-PHA copolymers with desirable material properties from lignocellulosic derived sugars, glucose, and xylose and to produce new PLA-PHA copolymers with specific repeating unit compositions from lactic acid and fatty acids. Successful completion of these studies will lead to the development of novel polymer production platforms with the potential to overcome lack of diversity and control over repeating unit compositions and thus material properties of existing bacterial PHA producing systems. Moreover, the proposed studies and research training activities are expected to have a broad impact on society, ranging from improving upon the science of biodegradable and biobased polymer synthesis to the development of new biomaterials for research, industrial, and biomedical applications. Thus the proposed research will lead to engineered E.coli strains that will be key platforms by which investigators can produce new and defined PHA biopolymers. Pseudomonas aeruginosa is an opportunistic, Gram-negative pathogenic bacterium that is responsible for nocosomial infections and chronic pulmonary infections in cystic fibrosis patients. P. aeruginosa produces numerous virulence factors such as proteases, cyanide, and redox activated antimicrobials called phenazines that are required for infection. It is known that the expression of several virulence related traits in P. aeruginosa is regulated by the sigma factor RpoN, which has to interact with other regulators called enhancer binding proteins (EBPs) for transcriptional activation. Interestingly, we found that the predicted EBP PA2449 was absolutely essential for the production of phenazines and for glycine catabolism in P. aeruginosa. Deletion of PA2449 resulted in the inability to produce phenazines under a variety of growth conditions. Earlier studies have linked phenazine biosynthesis with quorum sensing or anoxic growth, but it is currently not understood how RpoN or the hypothetical EBP PA2449 regulate expression of virulence factors in P. aeruginosa. We seek to define the function(s) of PA2449 in the global physiology of P. aeruginosa. Specifically, it is imperative to know what genes and operons are regulated by PA2449, and what signals PA2449 responds to in order to activate transcription. We believe that deeper understanding of the genetic network regulated by PA2449 will generate new strategies to prevent the expression of these virulence factors and thereby restrict the ability of P. aeruginosa to cause infection, particularly in the cystic fibrosis lung. The byproduct of biodiesel production is glycerol. This biodiesel-process waste glycerol is a low value commodity and the purity is very poor as compared to the USP grade of glycerol. A current project in the lab is to develop this waste glycerol as a feedstock for PHA production.